The upcoming season will be a tough one for Ademar León and their coach Manuel Cadenas, who is returning to his former club after a five-year absence. The squad has seen big personnel changes since their exit from the 2011/12 VELUX EHF Champions League season in the quarter-final. Baena has made his way to Créteil, Straňovský and Montoro are wearing the scarlet and blue strips of FC Barcelona Intersport this season, Andreu has signed for TSV Hannover Burgdorf, Čutura left to HCM Constanţa and Krivoshlikov is yet to find a new team. The club has seen ten newcomers come through the doors. Ranking third below FC Barcelona Intersport and Atlético Madrid BM in Spain, it will be no easy task for Leon to make it to the knock-out stage. “We want to achieve the best possible results; we know that our opponents are stronger than us. Besides that, we hope to keep up our ‘fighting spirit’ in the Spanish league and in the Champions League. We have a long way to go; our squad is still under construction. It is always important that the hard work is followed up with good results, because it gives the squad confidence, especially when you have so many young players like we have,” club manager José Ludena Montenegro said. ehfCL.com: What are your expectations for the upcoming season of the VELUX EHF Champions League? Manuel Cadenas: Our main objective is to be in the top four of our group to try to proceed to the next phase. Our group consists of teams which play at the top level in world handball, so it won’t be easy. ehfCL.com: What does the participation in the VELUX EHF Champions League mean to you and your club? Manuel Cadenas: For me personally it is the return to the ‘big stage’. For the club it is important to represent the club in a good light and to make it as far as possible in this competition. ehfCL.com: What teams are your personal favourites to reach the VELUX EHF FINAL4 and for winning the title this season – and why? 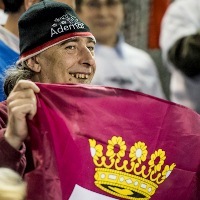 Manuel Cadenas: Clubs like Kiel, Barcelona, Atletico Madrid, Berlin or Montpellier have the potential to be part of the VELUX EHF FINAL4 and to go on and win the trophy. It will all come down to how a squad performs on the day in Cologne. Find more information on Ademar HERE.